Dr Natascha Müller – Multilingualism – A Barrier or a Blessing? Many children grow up in a multilingual environment, and they need to learn and use these languages in different settings. In some cases, they even need to learn and use a new language to confidently engage with their community and to grow within it. Dr Natascha Müller from the University of Wuppertal has been researching how multilingual children negotiate this situation, and how they stack-up against their monolingual counterparts in terms of language proficiency. Advancements in transport systems and communication technology have made it easier for people to relocate. Many move to a new country to flee disaster, to study, to work or simply to seek a better life. Others marry citizens of other countries. As a result, multicultural, multilingual societies are common. 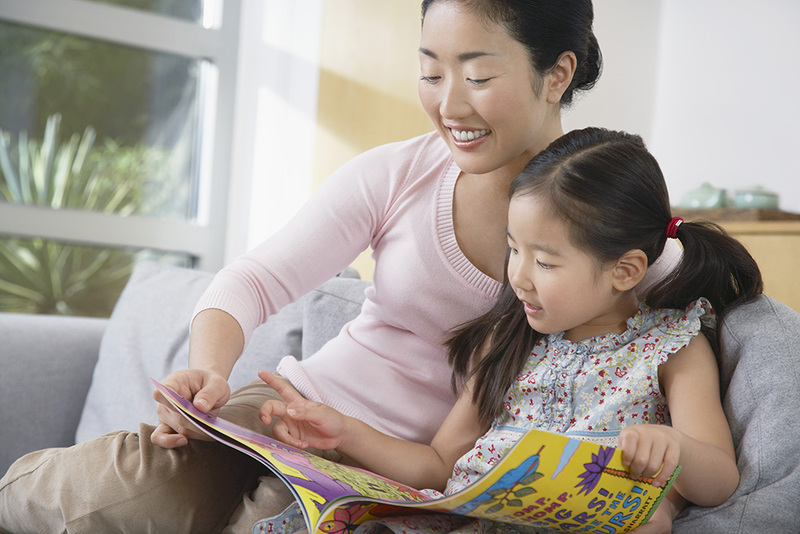 In most cases, members of a multilingual family will speak one or two languages at home. But they will often need to learn and use a new local language outside the home. As far as children are concerned, this local language is needed to engage effectively with schooling and their peers. As they get older, their second and third mother tongue will be called on in other contexts, such as to gain employment. Of course, this presents a challenge. There is a lot to negotiate and the stakes are high. Understandably, many focus their efforts on the language needed most, seemingly at the expense of another. If the disregarded language is their new language, then their success in their new local community could be jeopardised. By the same token, disregarding their first language, or that which is spoken at home, could negatively impact their personal or cultural identity. 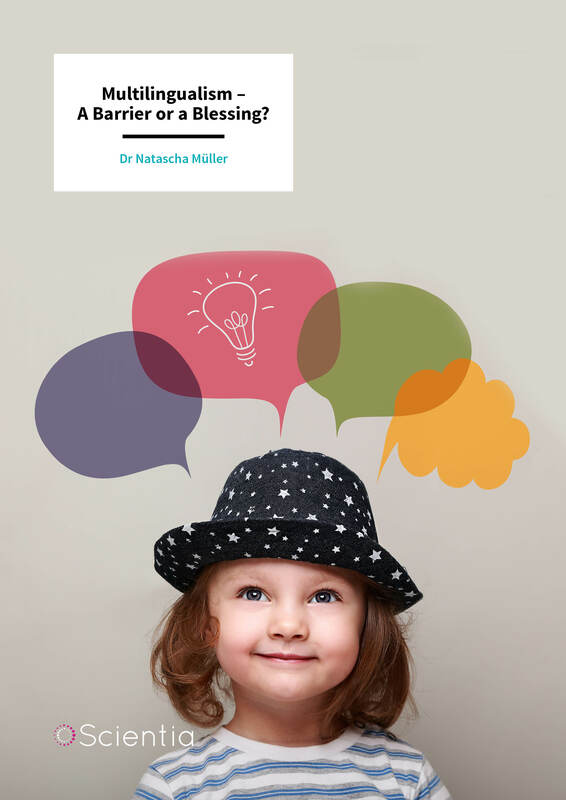 Dr Natascha Müller from the University of Wuppertal has devoted much time to understanding how children acquire languages, particularly in multilingual environments. And interestingly, while it has been suggested that trying to master two languages negatively impacts upon language proficiency, she has found that it’s not that ‘cut and dried’. In fact, in cases where a child learns three (or more) languages in early childhood and thus becomes a trilingual speaker, acquisition of a second or third mother tongue can be accelerated, even though the time of exposure is divided across three (or more) languages. Recent research into multilingualism has focused on how bilingual children acquire their two languages from birth. As a result, the information available focuses on that specific setting. From this research, linguists make assumptions about how children typically learn and use languages in their environment, and the potential barriers to becoming competent in the language used by society at-large. One of the main conclusions is that with bilingual children, the learning and use of one language can delay the learning of the other. However, Dr Müller suggests that limiting research to settings of bilingualism could be giving us a false impression. So, she decided to extend the scope of the research to include instances of trilingualism – where a child, due to their circumstances, has learnt three (and sometimes more) languages. By moving the goalposts, as it were, she has gained new insight. In a nutshell, she has observed that learning three or more languages helps children to more readily acquire and use complex language structures in comparison to their monolingual counterparts. The focus of Dr Müller’s work has been combinations of languages that include the so-called ‘Romance languages’. The Romance languages are those historically derived from Vulgar Latin; forming a subgroup within the Italic branch of the Indo-European language family. The common languages within this subgroup are Spanish, French, Italian, Portuguese, Romanian and Catalan. In one study, published in 2018, Dr Müller and her colleague examined multilingual children’s use of complex grammatical structures in German (see Fig. 1). German is not a Romance language, and is instead what’s known as a ‘V2’ language. This means that, in general, the verb follows the first part of the clause. Romance languages, on the other hand, are non-V2. Generally, the verb follows the subject, like it would in English. Through a series of tests, Dr Müller examined how multilingual and monolingual children were able to correctly make this distinction in spoken German. Interestingly, they concluded that in comparison with monolinguals, multilingual children have advanced skills in this area. In another article published in 2018, Dr Müller and her colleague tested whether skills in other Romance languages could speed up the acquisition of French (see Fig. 2). To do so, they tested the proficiency of 62 multilingual children living in Spain and Germany in using a certain complex grammatical structure in French, in comparison to monolingual French speaking children. In this instance, both the bilingual children and the children who acquired more than two languages were accelerated with respect to using that grammatical structure. Yet another 2019 study carried out by Dr Müller and her colleagues sought to investigate language mixing in multilingual children (a phenomenon known as code-mixing). Previous studies have claimed that multilingual children often mix their languages, and that they do so in order to fill competence gaps in their less proficient language from their more proficient language. In Dr Müller’s study, 122 multilingual children were tested in a monolingual setting, meaning that the interacting adult spoke with the child in her or his mother tongue and signalled that mixing of languages was not desired. The researchers observed that the children accepted the monolingual setting and behaved monolingually while communicating with the interlocutor. Another one of Dr Müller’s areas of study has been investigating how children use the Spanish base words ‘ser’ and ‘estar’ – derivatives of the verb ‘to be’. In summary, ‘ser’ is used when the object being described is in a permanent or near permanent state, while ‘estar’ is used when the object described is in a temporary state. For example, forms of the verb ‘ser’ would be used to describe someone who is married, short in stature or thin. Forms of the verb ‘estar’ would be used to describe someone who is ill, or lost, for example. Using these verbs in the appropriate context is a challenge for adult language learners, let alone children. In this particular research project, Dr Müller examined the use of ‘ser’ and ‘estar’ derivatives by 72 different children. While most children found using ‘ser’ derivatives to be far more difficult, Dr Müller found that children who have acquired another language with similar grammatical nuances (in this case, Portuguese and Catalan), were more adept at using ‘ser’ derivatives when communicating in Spanish. This was yet another example of multilingual children performing better than expected. Figure 1. The Crazy-House Test. Story: A mole was introduced to the child. Moles live under ground and have poor eyesight. A house was introduced that hosts crazy animals. 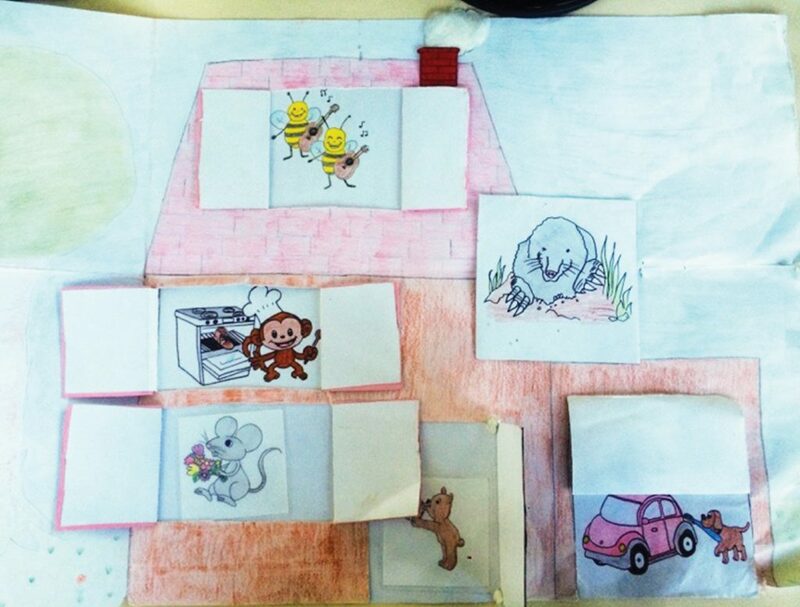 The child was asked by the experimenter to open the windows one after the other and describe to the mole what the animals do (play the guitar, kiss a ball, eat a bouquet, bake a shoe, clean a car). Dr Müller’s research projects have analysed language production and comprehension skills across different grammatical domains in French, German, Spanish and Catalan, focusing on children from trilingual backgrounds. Dr Müller has found that trilingual children perform extremely well in particular grammatical domains, including the position of subjects in French, the position of finite verbs in German, the choice of the verbs ‘ser’ and ‘estar’ in Spanish and Catalan. In fact, for some grammatical domains, the multilingual children outranked monolingual children, although the latter have more input in the respective language. This is true even for multilingual children who master the respective language to a limited degree. Figure 2. Story: A clown, boy, girl and grandfather were introduced to the child on separate cards before the test began. 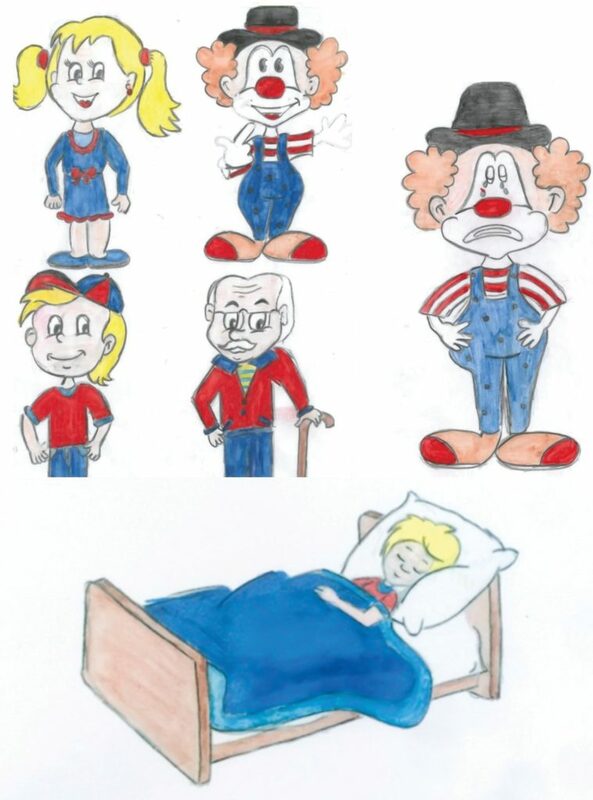 The child was shown a card by the experimenter and was asked to describe what the clown (cry), the boy (sleep), the girl ( jump) and the grand-father (laugh) do. Active multilingualism has often been seen as a hindrance, and in many cases, discouraged. However, as Dr Müller’s research has shown, it need not be. In fact, it is something that children should embrace. Remembering that languages are used to function in society and are integral to developing identity, the benefits to active multilingualism are clear. But how can it be promoted? Many people feel that if their children attend a bilingual kindergarten or school, then this can, through use, keep their languages alive. However, Dr Müller’s most recent research very much points to family input and cultural elements as having the greatest impact on promoting active multilingualism. These, therefore, need to be the focus. This includes the creation of a linguistically stimulating environment through cultural contact within the family. In conclusion, it is a challenge to learn a new language and adapt to a new community. Proficiency in the local language is a must – it affects one’s employment prospects, and one’s ability to acquire basic necessities and to feel contentment and belonging. It is vital, therefore, that we understand how children learn and adapt to these changing circumstances. 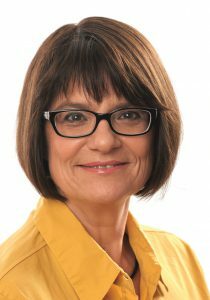 Dr Natascha Müller received her PhD in Linguistics from the University of Hamburg in 1992. Her thesis considered word order acquisition by bilingual German-French children. After her PhD, she stayed at the University of Hamburg for some years. She then relocated and was appointed as Professor of General and Romance Linguistics (French, Italian, Spanish) at the University of Wuppertal. She has also since taught and conducted research at many universities throughout the world, in countries including the US, Norway, Austria, Spain and Canada. She has also worked with many other professionals in the field to develop learning resources for studies in linguistics, especially the Romance languages. The focus of Dr Müller’s recent research has been the accelerated acquisition of languages by children in multilingual environments in comparison to their monolingual counterparts. L Arnaus Gil and N Müller, Acceleration and Delay in Bilingual, Trilingual and Multilingual German-Romance Children, Linguistic Approaches to Bilingualism, 2018, DOI: 10.1075/lab.17081.arn. L Arnaus Gil and N Müller, French Postverbal Subjects: A Comparison of Monolingual, Bilingual, Trilingual, and Multilingual French, Languages 3 (3), 2018, 1-28, DOI: 10.3390/languages3030029.